Karl’s sister, Lorna, owned a restaurant in Los Angeles that Britt had applied to for a job, however while Lorna was running late, Britt got talking to a visiting Karl and the pair had an 'instant connection'. "It took several weeks for anything to happen since Karl was playing it cool," laughs Lorna, "I had to ask him out!" The couple managed a long distance relationship for the best part of a year, knowing it was 'the real deal'. When it came to their proposal, it was as Hollywood as they come: "I was coming from a photoshoot and Karl told me to meet him at the David Hasselhoff star on the Hollywood Walk of Fame. 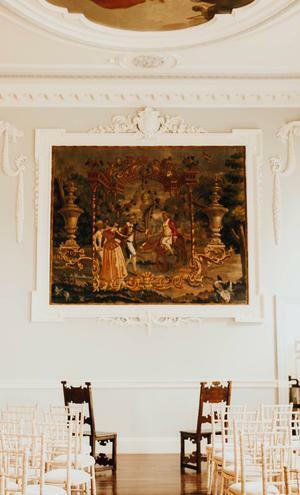 He had booked a room at The Roosevelt Hotel and while he was leading me to the room he put on a song (Jape's “Floating”) which we both loved from my first trip to Ireland to meet up with him. "He opened the door and had decorated it with flowers, streamers, balloons, and confetti. He got down on his knee and said "You’re my best friend.." and I can’t remember anything else that was said because I started ugly crying... but I said “Yes”!" After the yes Britt and Karl opened a bottle of Champagne and in true modern engagement form, made slow-mo videos of them both jumping excitedly on the bed, before going to a sushi restaurant for dinner. 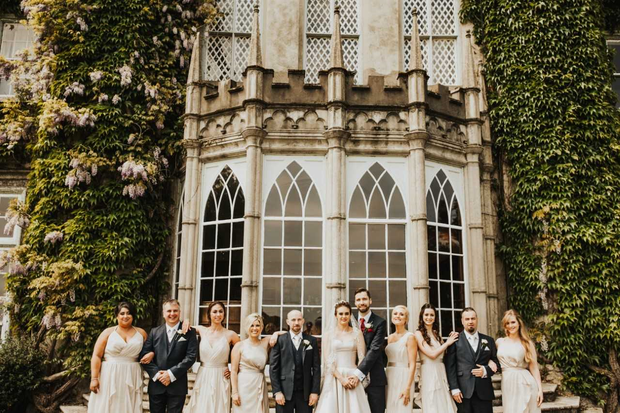 The couple chose to tie the knot in Ireland in the summer, so that Karl's family could all attend the occasion, and selected Luttrellstown Castle as their backdrop. Their photographers were The Bold Americana (Emma Johnson) and Belle and Epic (Tara Nelson). 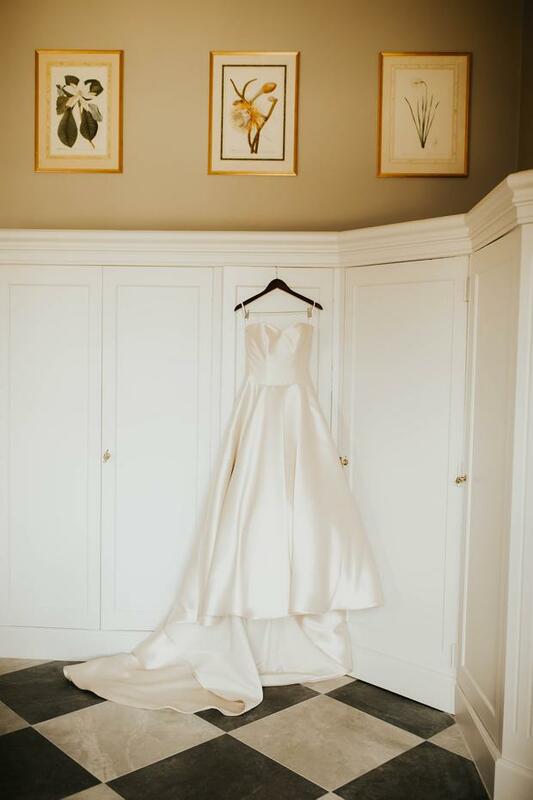 Britt found her beautiful ivory Justin Alexander ballgown in Mon Amie Bridal in Costa Mesa, California. 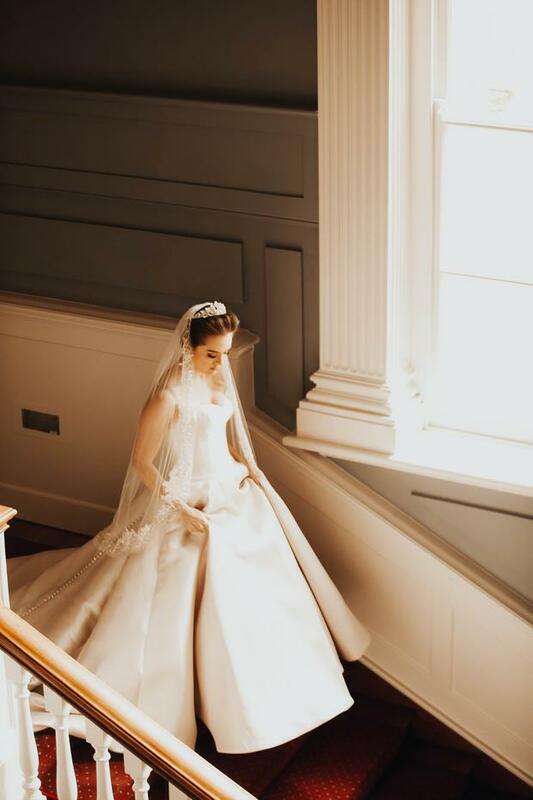 "Wedding dress shopping was interesting," she says, "I thought I had an idea of what I wanted when I went in to the first shop, but I ended up trying on dresses that weren’t within that original image and I’m so glad I did. It gave me the opportunity to see different silhouettes I wouldn’t have considered before. 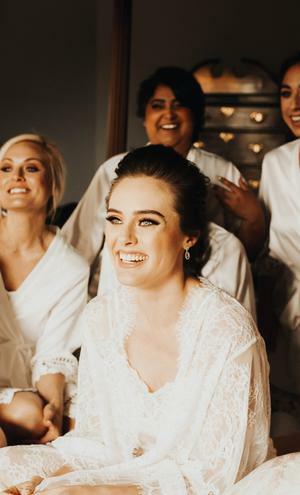 I was set on having a white dress but when I tried on the Justin Alexander I just knew I didn’t want to wear anything else! It did mean having to shift my original color palette since it wasn’t white but I’m so happy I found that dress." Britt accessorised her dress with shoes by Badgley Mischka and wore her mother's vintage diamond earrings. 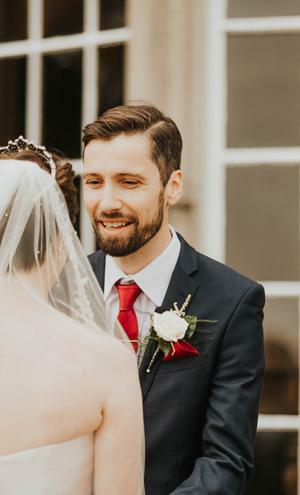 She finished the look off with a sparkling tiara, which complemented her vintage 1915 engagement ring perfectly, and a pearl and lace embellished veil. Her hair was styled by Paul Davey, and make-up done by Sue Brophy. 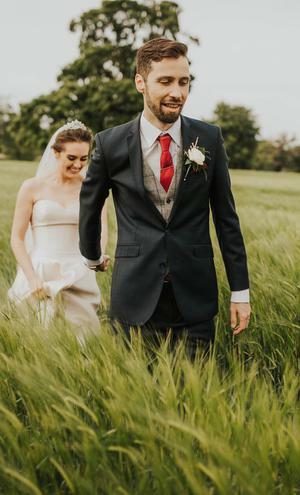 Britt's bridesmaids wore dresses from David's Bridal in the US, while the groom and groomsmen dresses in rented suits from The Formal Suite in Dublin: "They were so great to work with and had a pretty great selection for suits, so we found what we wanted quickly. The groomsmen did have a separate fitting closer to the wedding date and I was told they had a great time. Might’ve been the pints afterward!" 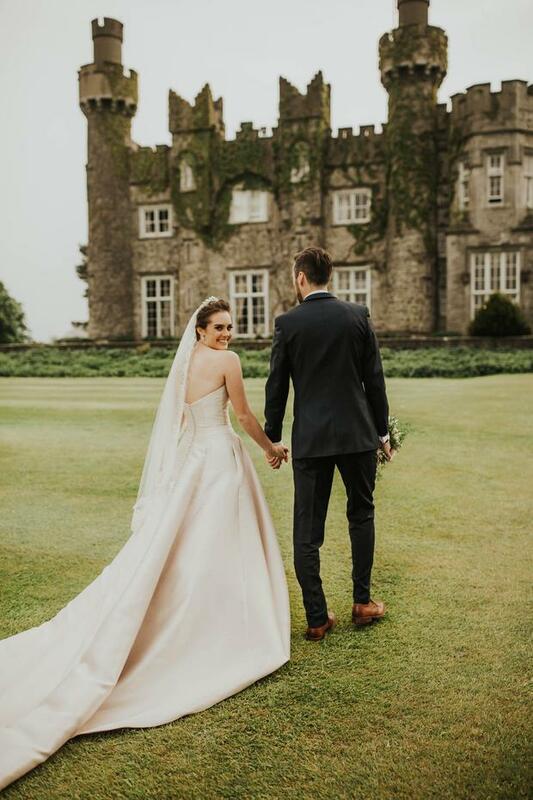 The bride says she didn't have a theme when planning the big day, knowing that Luttrellstown Castle would set the tone for a beautiful occasion: "The main goal for us with planning was to make sure that we had a great time with loved ones, so music became the most fun part of planning for us. The couple chose The Cazettes as their band, the lead singer being the now fiancé of Karl's best man. "We were so lucky we could book her for the wedding," says Britt. "Her voice is amazing and the band members are so extremely talented. It added such a personal touch, which was really important to us." 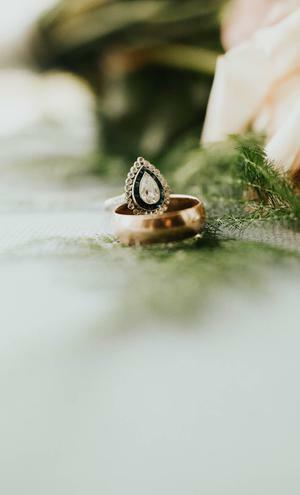 While the couple were based in the US throughout the planning process, they found pulling the celebration together fairly straight-forward: "For the most part I just went with the flow and tried not to be too concerned with details. Being based in LA there wasn’t too much I could do from over there, I couldn’t even taste test the food at the venue! As florists, Karl’s mother and sister wee well capable of handling the flower arrangements, while the groom's friend Tom made the cake stand ("it's one of the most unique stands I’ve ever seen - the top actually pivots"). Tom also hand engraved a sign for the couple's “sign-in Jenga set” guest book. For the ceremony on the day, the couple had a secular celebration presided over by their good friend Paul Major: "It was the perfect blend of humour and touching moments, both of us knew we would end up crying pretty hard so we wanted to make sure there were moments to make us laugh. Paul delivered it so well." 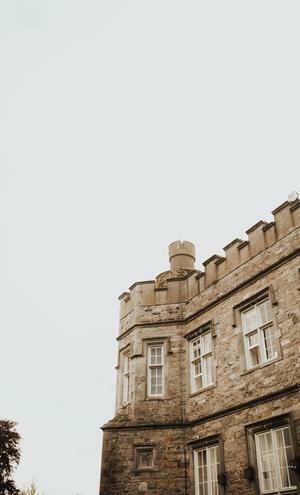 Both Britt and Karl wanted to find a venue in Dublin, and were blown away by photos of Luttrellstown Castle when they saw them. "I just thought it was perfect," says Britt. "The fact that the rental includes the entire property was also an added bonus. 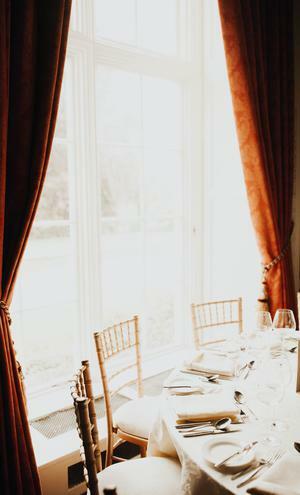 They have 12 bedrooms, which we used for family and bridal party." "I wanted to make sure that Karl’s family would be able to make it, which was why we decided to do it in Dublin. It ended up working out to be almost half Irish and half Americans, which was amazing! Truthfully I wasn’t expecting so many of my friends and family to come but it turned out to just be such an awesome day." "We tried to keep a good balance of food on the menu," says Britt. "Since we couldn’t try it beforehand, we went with what sounded good for us and then tried to think about what most people would like as well. It ended up working out perfectly. We had cold and hot canapés for the reception, which were served with a glass of prosecco. We also had late night food served closer to midnight - sliders, fish and chips... - which isn’t normal in America, but was a huge hit with all of the guests." "I just felt like I was floating on a cloud of happiness the entire day" says Britt. "The ceremony was unique to us so that was a great part. "I think my favorite part was when we surprised everyone with fireworks after dinner was over before dancing and cake. We used the company Black Powder Monkey that was referred to us by the venue coordinator. It was just such an amazing show, we weren’t expecting it to last as long as it did. Our little niece was right by us on her dad’s shoulders and she was in complete awe, and it really was such a cool inward moment to be there with all of our friends and family and be by the man I love, watching something so beautiful." In terms of anything she'd change about the day, Britt says she just wished she had remembered to open some Champagne while she and the girls were getting ready that morning! "It completely slipped my mind and all my friends were too nice to ask" she laughs. "Other than that I don’t think I’d want to change anything, even with the mistakes or minor things going wrong the good moments were too perfect to mess with." 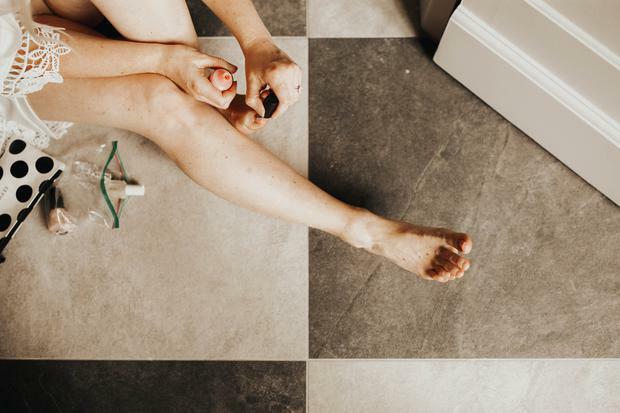 "It’s very easy to get wrapped up in the small things," admits Britt, "it happened to me a few times and it’s really easy nowadays with social media and pinterest..."
"I think the best thing is to take a second if you’re stressing over a detail or over anything really and ask yourself would I normally care about something like this? If the answer is no then go with the flow and move forward. I can be detail oriented but I’m pretty laid back and easy going, so reminding myself that maybe I wouldn’t care how some detail looked took a lot of pressure off in the long run. And on the day itself? "For me things hadn’t been going right with a bunch of things and I was stressed out. But right before the ceremony I made myself take breath and told myself that whatever will be, will be and what a difference it made! 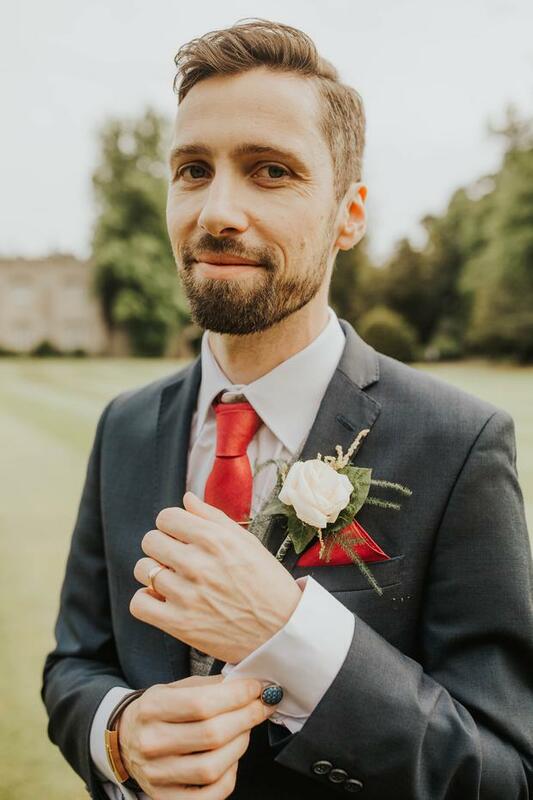 I was 100% present in the moment going forward and it’s so much better to experience your wedding instead of thinking ahead to what’s next or what will go wrong."